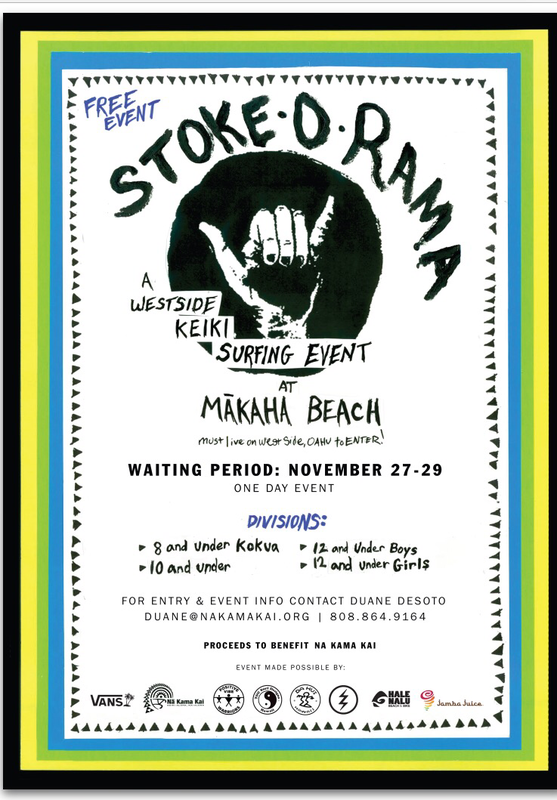 Nov 27-29 Nā Kama Kai will be hosting Stoke O Rama at Makaha beach for a one day event. Free entry, lunch for keiki, goodie bags for all entries, raffle to benefit Ray Ray, youth canoe surfing exhibition, Jamba Juice for each keiki, and super good fun time for west side keiki only. All surf division are kokua style. Even if they 12 and need help. Bubble guy will be there sharing the Stoke of Bubbles. Ata Pae doing a 300lb quarter hind for all to enjoy. Brian Keaulana bringing the subsquatch and helping with water patrol. Gudauskus Brothers flowing the Vans goodie bags. Please spread the word, print the flyer and post where keiki can see, and share the flyer with the community. Call Duane at 864-9164 or email me at duane@nakamakai.org to enter or for more info. Mahalo for all your kokua the Stoke out the keiki. Mālama pono.